Freshwater pearls can be grown in every conceivable shape and exhibit an unparalleled palate of pastel colors ranging from dark purple, to light pink and white, as well as uncommon exotic and metallic colors. 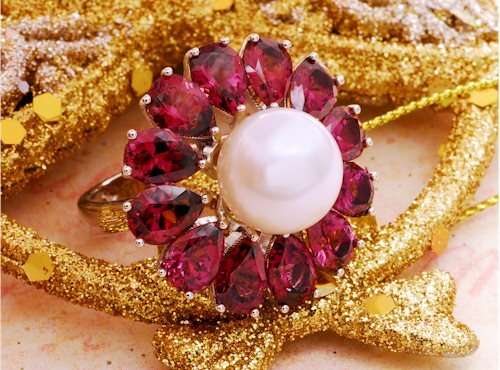 Freshwater pearls are quite possibly the most versatile variety of pearls produced today and they are special because of the exotic shapes and colors in which they occur, the large quantities in which they are produced, and their consequent affordable prices. Their growth rates are faster than their salt water cousins and the insertion processes are easier. An amazing selection of shapes are always available because the pearl’s growth just follows the shape of the inserted nucleus. Spheres, buttons, drops, and crosses are the most common shapes. The round or near-round freshwater pearls makes up only a small percentage of all pearls produced. In general, freshwater pearls are not as lustrous as saltwater pearls, but they are less expensive and have a wider variety of shapes and colors. And because they don’t have a bead nucleus, they are solid nacre and hold up better against chipping and other wear. Contrary to popular belief, oysters do not produce freshwater pearls. Freshwater pearls are cultured in freshwater mussels belonging to the family Unionidae. They are similar in shape to common marine mussels but grow much larger and live far longer than their marine relatives. Chinese Unionids include H.cumingi ("triangle shell") and C. plicata ("wrinkle shell" or "river shell".) A freshwater mussel can accept up to 50 pieces of mantle tissue and it can yield up to 40 tissue-nucleated freshwater pearls from those implants. The growth period for freshwater cultured pearls ranges from two to six years and many mussels succumb to pollution and disease before the pearls have reached their peak. The Chinese were the first to culture freshwater pearls and used their techniques to produce mabe type pearls in the shape of a Buddha. The first actual cultured freshwater pearls were produced in Lake Biwa, Japan and the initial production appeared in the 1930’s. The production thrived for almost 50 years and finally began to decline because of pollutants from the farms, resorts and industries around the lake. The bulk of today’s freshwater pearl production occurs in China. With plentiful and inexpensive labor along with innovative technologies and a huge landmass with countless available lakes, rivers and irrigation ditches China has moved to the forefront of freshwater pearl production. The shapes, luster, and colors of the most recent Chinese production often matches an even surpass the original Lake Biwa quality.